The story begins about 225 million years ago, when all the continents formed the single land mass of Pangaea. The Temecula Canyon region was then underneath the ocean just offshore. Mud and sand accumulated on the ocean floor, which sank as the material piled up. As much as 30,000 feet of sediments eventually accumulated! This formation is now the reddish Bedford Canyon Formation found on the north side of Temecula Gorge. About 200 million years ago, Pangaea began to break apart, and the nucleus of North America began to override the oceanic crust which contained the Bedford Canyon Formation. As a result, the mud and sand of the Bedford Canyon Formation were transformed into shale and sandstone as they got progressively buried, due to the increased heat at lower depths and from the pressure of the material above them. About 150 million years ago, the oceanic crust from further west began to be forced underneath the Bedford Canyon Formation, a process called subduction, and began to melt. Some of this molten rock erupted to produce a chain of volcanoes like the volcanoes found in island arcs such as the present-day Aleutian and Japanese Islands. The erupted material is now the Santiago Peak volcanics, which formed mostly underwater and are as much as 1,000 feet thick. For the next 75 million years, the subduction continued, which produced vast pools of molten rock several miles below the surface and a string of volcanoes much like the present-day Mt. St. Helens, Mt. Shasta and Mt. Lassen. This molten rock was mostly beneath the Bedford Canyon Formation, except where it forced its way to the surface in volcanoes. The heat from the molten rock metamorphosed some of the Bedford Canyon Formation. That is, some of the Bedford Canyon rocks partially recrystallized and others were slowly deformed, changing the initially flat layers to sometimes contorted shapes. The Bedford Canyon Formation was only weakly transformed, and mostly retains evidence of the layers of the original deposition. However, those layers are no longer always horizontal – in at least one place in Temecula Canyon, the initially horizontal layers are now vertical! Finally, 75 million years ago, the angle of the subducting oceanic crust changed to a more shallow angle, which caused the area of molten rock to move east into Arizona and New Mexico. The volcanoes of the Temecula Canyon region became dormant, and the molten rock began to solidify, producing the granitic rocks of the batholith that underlie the entire Peninsular Ranges. Those granitic rocks are locally called the Woodson Mountain granodiorites, and are found on the south side of the gorge. 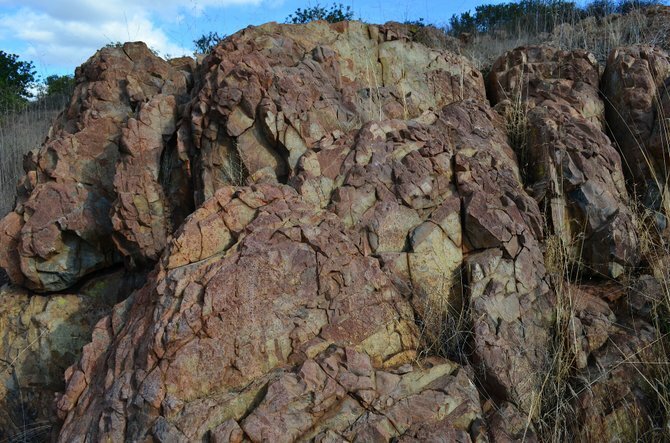 These are the rocks we know and love in San Diego County which form the big beige boulders on the hillsides, whereas the Bedford Canyon Formation weathers more as a unit into reddish soils. For 70 million years, nothing much exciting happened to the Temecula Canyon area except the slow process of erosion. The high volcanic mountains were worn away, and the area became a very flat coastal plain. It is possible that the Santa Margarita River got its start during this time at approximately its present-day location. That location may have been determined by this local junction between the Bedford Canyon Formation and the Woodson Mountain Formation, which may have produced a local zone of weaker rock. A hiccup of volcanism occurred 9-10 million years ago, when the Santa Rosa Basalt erupted on the surface and deposited a ~100 feet thick layer of dark red / brown basalt, topped by a bit of white tuff, over an area of ~200 square miles that probably ranged from roughly just north of Murrieta to the San Luis Rey River in Bonsall. Then, 5.5 million years ago, the boundary between the Pacific and North American plates moved to the location of the present-day Gulf of California, and the area became interesting again geologically. An oceanic spreading center tore Baja California away from mainland Mexico, and the San Andreas Fault, and its host of accompanying faults, became active. The Santa Ana Mountains began to form by uplift along their eastern end at the Elsinore Fault. As the mountains were uplifted, it is likely that the Santa Margarita River was able to wear away the rock as fast as it was uplifted, staying in the same place at the same height as the rocks rose around it. The river is thus an antecedent river, existing before the mountain range surrounding it. Otherwise, it would be very difficult to explain how a river formed in the lowland area of Temecula suddenly cuts across a high mountain range! 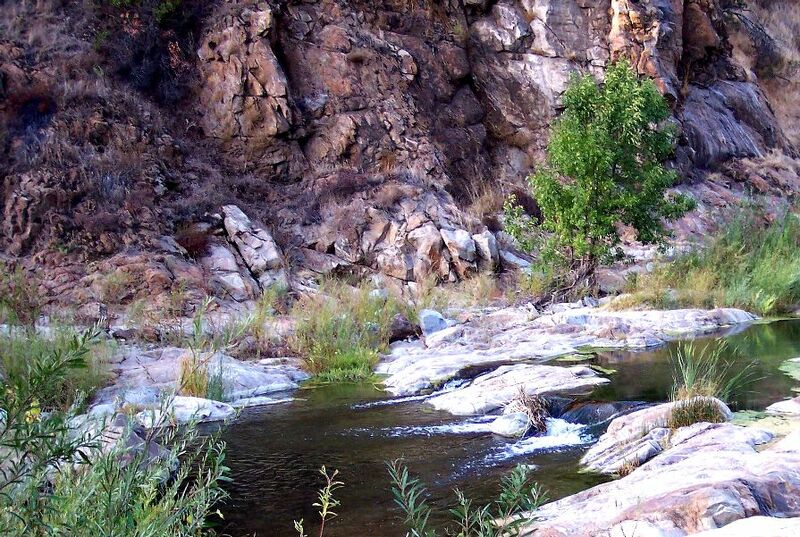 Although the Santa Rosa Basalt has been removed from the rocks in Temecula Canyon, cobbles of it can be found in the riverbed which have been eroded from the upper drainage basin of the Santa Margarita River. 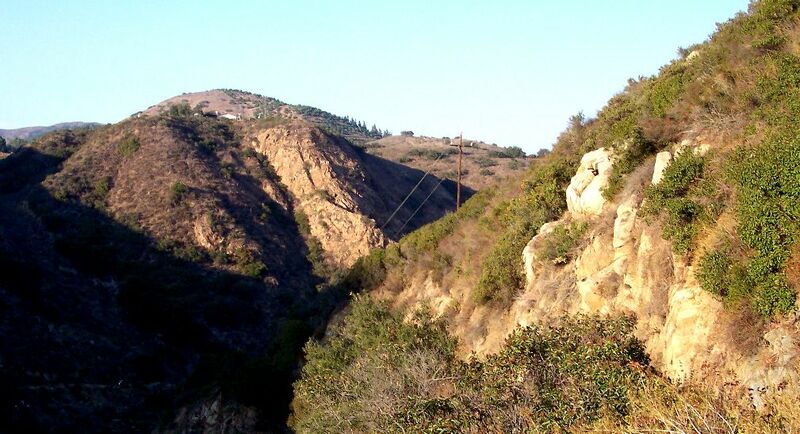 Temecula Gorge is located in the Santa Margarita Ecological Reserve, which is open to the public only by pre-arranged tour. 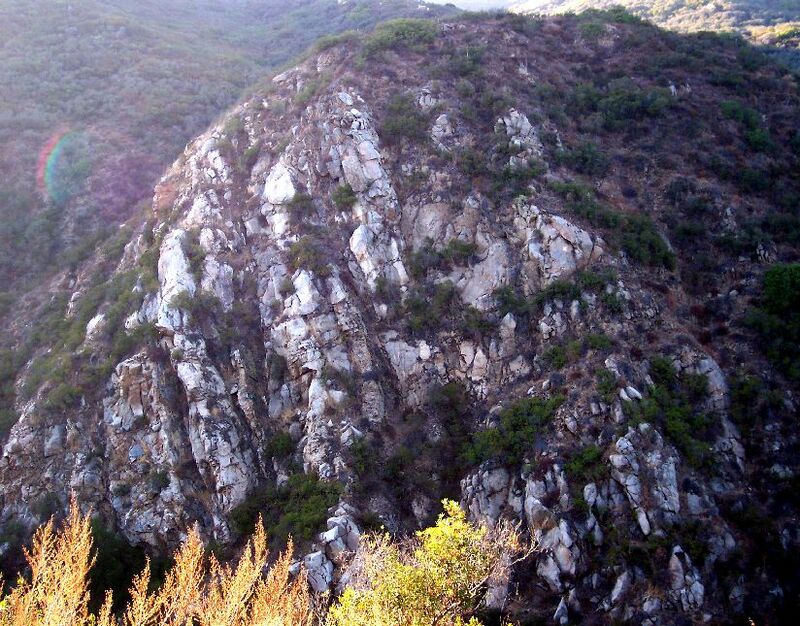 If you go on one of the tours, from the Gorge overlook, or down in the Gorge, be sure to take a look to the north and south and see the quite apparent differences between the Bedford Canyon Formation and the Woodson Mountain granodiorite. The Rise and Fall of San Diego, Patrick L. Abbott, 1999, Sunbelt. Geology of San Diego County, Diane M. Burns, ed., 1997, Sunbelt. Recency and Character of Faulting Along the Elsinore Fault Zone in Southern Riverside County, 1977, Special Report 131, California Division of Mines and Geology, by Michael P. Kennedy. A Field Guide to Coastal Southern California, Robert P. Sharp, 1978, Kendall-Hunt. Below: View of Santa Rosa Basalt forming the flat top of Mesa de Burro, typical Woodson Mountain Granodiorite Boulders in the foreground, and the Bedford Canyon Formation in the middle. Above: View of bottom of Temecula Gorge, with a massive piece of Bedford Canyon Formation on the far side of the river, a good-sized chunk of it in the foreground, and inclusions of it within the Woodson Mountain Granodiorite that forms the bed of the river. Note the different phases of the Woodson Mountain Granodiorite as shown by different shades of blue. Along the Santa Margarita River, the floor of the canyon containing the river is narrow (~15 m to ~50 m wide) with walls commonly inclined as much as 45° or more. Hanging up to 50 to 90 m above the floor of the canyon are several tributaries that dissect a broad undulating terrain covered by Entisols, Inceptisols, and Alfisols. These soil orders overlie an interval of paralithic materials composed of corestones and saprock that locally reaches 30 m in thickness (Nettleton et al., 1970; Knecht, 1971). The lower limit of the paralithic material is unweathered plutonic rock. These relationships suggest that the cutting of the Santa Margarita River post-dates the development of this broad undulating terrain and by inference the paralithic material that characterizes it. Pearl and Waters (1999) provide geochronological data derived from river terraces that indicate that the initial down cutting of Los Flores Creek, the next major drainage 7 km to the northwest of the Santa Margarita River, likely began during the world wide drop in sea level ~24,000 to ~18,000 years ago. Given the close proximity of the two rivers, it seems likely that the down cutting of the longer Santa Margarita River either originated during this event, or alternatively, if it existed prior to the cutting of Los Flores Creek, then its channel was likely deepened during the drop in sea level. Hence, by at least the late Pleistocene, at the time of initial or secondary down cutting of the Santa Margarita River, the development of the corestone and associated paralithic materials had likely been initiated. If these interpretations are correct, then the landscape at SMER is at least in part late Pleistocene in age, and thus represents a key natural resource that should be preserved. Kennedy, 2000; Johnson et al., 2006, 2007, 2008). Grant, L.B., Rockwell, T.R., 2002. A northward-propagating earthquake sequence in coastal southern California? Seismol. Res. Lett. 73, 461–469. Grant, L.B., Shearer, P.M., 2004. Activity of the offshore Newport–Inglewood Rose Canyon fault zone, coastal southern California, from relocated microseismicity. Bull. Seismol. Soc. Am. 94, 747–752. Hull, A.G., Nicholson, C., 1992. Seismotectonics of the northern Elsinore fault zone, southern California. Bull. Seismol. Soc. Am. 82, 800–818. Jennings, C.W., 1994. Fault activity map of California and adjacent areas with location and ages of recent volcanic eruptions. Calif. Geol. Data Map Series, Map No. 6, Calif. Div. Mines and Geol. Johnson, S., Bearor, C.G., Rayburn, Z., Martinez, C., Stackpole, K.L., Girty, G.H., 2006. The texture and chemistry of tonalitic saprolite, Santa Margarita Ecological Reserve, Temecula, California: implications for saprolite development. In: Bonsangue, J., Lemmer, R. (Eds. ), Geology of the Orange County region, southern California. S. Coast Geol. Soc., Annual Field Trip Guide No. 33, Santa Ana, CA, pp. 213–228. Johnson, S.L., Martinez, C., Bearor, C.G., Hebeler, A., Rayburn, Z., Girty, G.H., 2007. Petrological and chemical properties of corestone and saprolite, Santa Margarita Ecological Reserve (SMER), California: evaluating models of their origin; Abstracts with Programs. Geol. Soc. Am. 39, 25. Johnson, S., Hebeler, A.K., Martinez, C.R., Biggs, M.A., Girty, G.H., Kimbrough, D.L., 2008. Saprolite-corestone development at Santa Margarita Ecological Reserve (SMER), Peninsular Ranges, California: Clues to the onset of chemical weathering in a Mediterranean climate. Abstracts with Programs. Geol. Soc. Am. 40, 36. Knecht, A., 1971. Soil survey of western Riverside Area, California. U.S. Gov. Print. Office, Washington D.C. 157 pp. Nettleton, W.D., Flach, K.W., Nelson, R.E., 1970. Pedogenic weathering of tonalite in southern California. Geoderma 4, 387–402. Pearl, F.B., Waters, M.R., 1999. A geoarchaeological assessment of alluvial valleys at Camp Pendleton with an overview of the important natural site formation process. Pac. Coast Archeol. Soc. Quart. 35, 19–32. Petersen, M.D., Wesnousky, S.G., 1994. Fault slip rates and earthquake histories for active faults in southern California. Bull. Seismol. Soc. Am. 84, 1608–1649. Tan, S.S., Kennedy, M.P., 2000. Digital geologic map of the Temecula 7.5′ quadrangle, San Diego and Riverside counties, California. Calif. Dept. Conserv. Div. Mines and Geol.